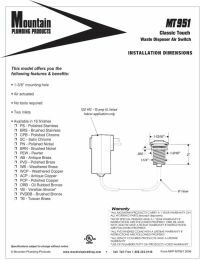 Mountain Plumbing MT951 Round "Classic Touch" Waste Disposer Air Switch is designed to provide safe, convenient disposer activation. You don't have to worry about turning on the disposer with wet hands, making it perfect for island or other damp environment insallations. The MT951 can be used with ALL continuous feed waste disposers with attached power cords.